Let celebrate all the anniversaries all at once. Well, serially, but in rapid succession. Thus: Steel, Silk, Lace, Ivory, Crystal, China, Opal, Silver, Pearl, Coral, Ruby! Congratulations! Listen to Happy Anniversaries 11-40 on spotify now! and follow us on spotify. 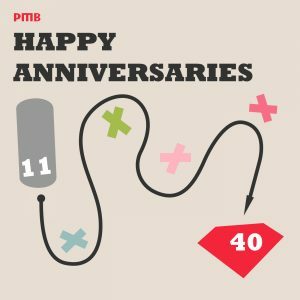 Why Happy Anniversaries 11-40? Because previously on pmb Happy Anniversaries 1-10. This entry was posted in playlist and tagged anniversaries, china, Coral, Crystal, Ivory, Lace, Opal, Pearl, Ruby, Silk, silver, Steel. Bookmark the permalink.